The Lost Vape Orion Q 17W Pod System is the successor of the Orion DNA GO 40W Pod System and boasts high quality craftsmanship and excellent performance at a lower price point. The two unique products DO NOT have cross compatible pod systems, but share the same high quality Lost Vape performance that have come to expect. The Orion Q utilizes a proprietary chipset with a 17W maximum output and utilizes a single button interface. 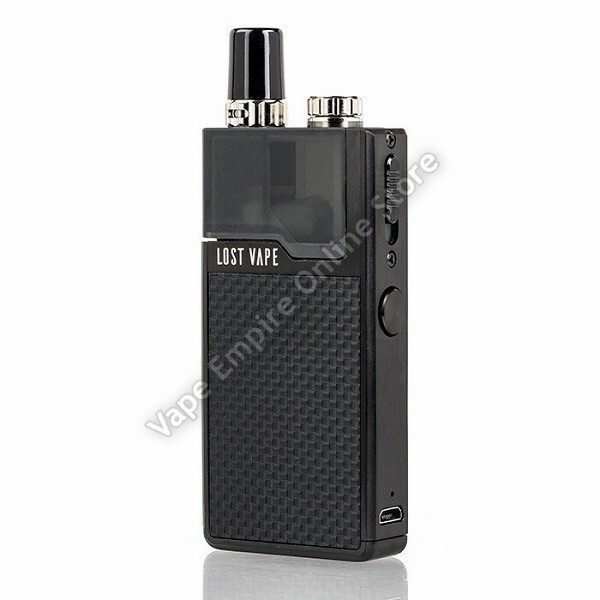 This pod system has a massive 950mAh battery paired with a battery life indicator that glows when the firing button is pressed. The LED battery life indicator will show blue between 100 to 64%, purple between 64 to 18% and red between 17 to 0% battery life. Along the side of the device is the cartridge locking slide and the micro USB port. The body of the Orion Q features premium stainless steel chassis construction. The Orion Q replacement pods have a 2ml maximum capacity with a 1.0 ohm atomizer resistance that is suitable for use with both nicotine salt and regular e-liquids. The Orion Q replacement pods have an adjustable 5mm by 1mm air slot located below the drip tip, which allows for both MTL and DL vaping. The replacement pod locks in place through the Orion Q's sliding lock system and has a 4mm bore proprietary drip tip. Each replacement pod has an expected life span on 7 to 14 days based on use. The Lost Vape Orion Q is an excellent option for users looking for the quality performance of the Orion without the intricacies of the DNA Chip and eScribe system.